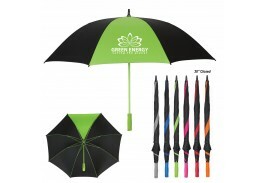 Leave a lasting impression on your clients a customized golf umbrella! Perfect for sponsoring a tournament, promotional golf umbrellas are an effective way to get your company noticed, on and off the golf course. Because once the tournament is over, people will use your gift whenever it rains, providing you with greater exposure than say, a golf towel. 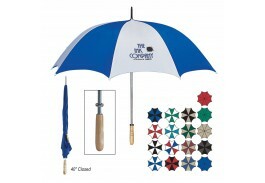 Available in many styles and colors, the Custom Umbrella Store has a great selection of personalized golf umbrellas that open manually or automatically, with additional features such as wood handles and matching cases. We even have vented custom imprint golf umbrellas to protect players against strong winds and driving rain. Logo golf umbrellas are a favorite both on and off the course, known for their size and sturdiness, and are the perfect promotional item to make your business name stand apart from your competitors. Unique and affordable, our promo golf umbrellas are designed to beautifully showcase your brand name and logo, and are available in a large selection of colors and designs. Starting at only $6.25, you are sure to find a custom promotional umbrella that makes your logo pop, without breaking the bank!